Read on how to identify the artist and name of this etching by just clicking on it. Not really the first place you would look for an original etching: Last time, it was the kitchen, now it is (or rather: was) the bathroom of the Catholic University of America in Washington D.C. As reported by the Washington Post (and mentioned in numerous other places as well), a framed, potentially original Rembrandt etching, was discovered under a pile of junk in a bathroom twelve years ago. 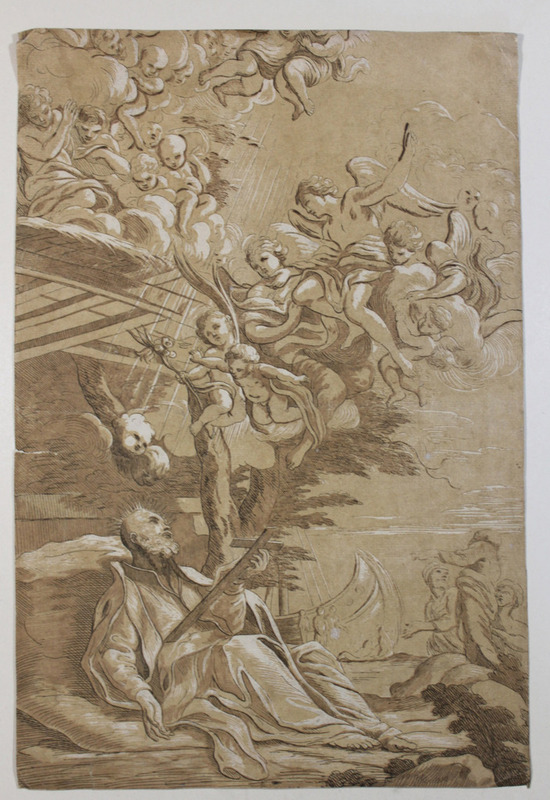 The print now has been confirmed to be an impression from the original plates, although it remains unclear in which year the print was made. Judging from the photos, the print itself is not in a very pristine condition: foxing and tiny holes are witnesses of the not so optimal storage conditions this specimen had to withstand. It is quite curious that in the news coverage the print is referred to as the “mysterious Rembrandt” and nothing much is said about the etching itself . The translated french inscription “The bust of an old man with a great beard seen about most of the face…” is quoted to shed some light on the authenticity or the depicted character. 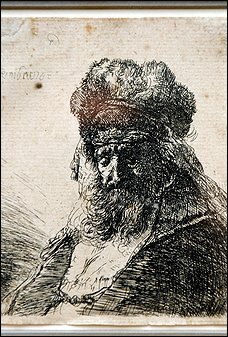 Well, “a old man with a great beard” applies to a number of Rembrandt etchings, including his self portraits. What we have here is an imprint of the plate “Old Bearded Man in a High Fur Cap”, created in 1635 (B., Holl. 290; H. 130; BB. 35-3). The Detroit Institute of Arts web page features a nifty “zoom-in lens” of their specimen. The etching at CUA can be seen in a small exhibition at UAC, Washington D.C., USA. There is also a short video on the history of the discovery (or should we rather say: unexpected find). Youenoch has an aminated version of Hypnerotomachia Poliphili. Mercuriuspoliticus was delighted to see “The Headless Horseman”, an engraving by Pierre Lombart which underwent some drastic changes. Clara Lieu spotted the grouchiest looking putto ever in the etching/engraving Allegory of the Arts by the Italian Andrea Giovanni Podesta (1608-~1674). The iconic woodblock print In the well of the great wave off Kanagawa by Katshushika Hokusai (1760-1849) was sold at Christie’s for $68’500. The equally beautiful The Tama River in Musashi province from the same series Fugaku sanjurokkei (The thirty-six views of Mount Fuji) fetched $5’000. Edward Sozanski shows us When European prints went supersized.